I coupon. Most of my friends coupon. We don't have alot of stores to choose from in our area but the ones we can shop at are usually pretty good about the couponing. We are by no means extreme couponers. That show is a joke. Some of the episodes clearly show people breaking the law. You see people clearing stock and pre-ordering god awful amounts of crap. Unless you are a health fanatic, and some of these women clearly are not, do you really need 300 bottles of Gatorade?? And honestly are they ever going to need 100 bottles of pain killers, before they expire? The home goods like toilet paper, paper towels and women's care products, shampoo and the such I can understand tho. You see people running to foreclosed homes an grabbing the paper on Saturday am. Last time I checked that was still stealing. It even promotes dumpster diving. What part of these signs mean, "ok you can dive for coupons"???? CLEARLY STATED, DON'T YA THINK???????????????????? There are alot of places you can get these money saving little pieces of paper. The newspaper, except on holiday weekends, and the Internet are the most popular. Go to the manufactures website. 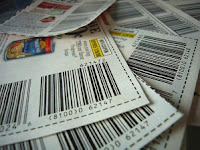 Some product sites require you to make an account to log in and they have printable coupons. Most sites only allow you to print 1 or sometimes 2 per IP address. That's why some couponers have 2 or more computers. Here are a few sites that I use. https://www.recyclebank.com/ You can earn point to redeem for coupons. https://savingstar.com/ This is not a print site. You sign up and list your store cards to save. Then the money is deposited to your Pay Pal when you save $5.00 or more. No matter how you get your coupons, you have to be aware of fraud. If a coupon seems too good to be true, look it up. There is a website, The coupon information center, that is full of information and has a listing of most of the current fraud coupons. And the one thing that gets me most of all, LOOK UP THE STORES COUPON POLICY BEFORE YOU SHOP THERE!! These can change without notice so it doesn't hurt to check them. Nothing worse than someone who is ignorant on the policy arguing with the cashier and/or manager at checkout. Gives the rest of us a bad name. That, along with clearing off a shelf because you have 90 coupons for 1 type of noodle that's on sale! Leave some for the rest of us! Flag Day....What does it really mean?